What we in the US call the “French” press is one of the more mainstream gateways to a heightened appreciation for coffee. If you had asked someone whether they were into coffee prior to the renaissance (or fad, depending) in theatrical methods like siphons and pour-overs, they would have likely responded in the affirmative by talking about how they love their French press. Then they’d complain about how annoying it is to clean. While KitchenAid hasn’t solved the cleaning riddle yet, they have come out with an innovative upgrade for this humble brew method: the new KitchenAid Precision Press (above). It’s part of a full suite of “craft coffee” equipment the brand has launched to cater to mainstream consumers who are becoming, if not fully literate, at least more aware of the world of coffee that exists beyond dark roasts and “bold” cliches. The Precision Press is the most unique item in the lineup – so, when Single Edition Media reached out on behalf of KitchenAid to sponsor a review, I asked them to send over the press. The double-walled metal construction for temperature stability is great, but not groundbreaking. What’s truly new, and what piqued my interest, is the built-in scale and timer. The timer begins counting up when you press a button on the handle, and resets if you hold it down. The scale can be tared quickly to weigh both coffee and water, and easily switches between grams or ounces depending on your preference. This elegant combination brings the press up to speed with the modern coffee zeitgeist’s emphasis on consistency and measured brew ratios. 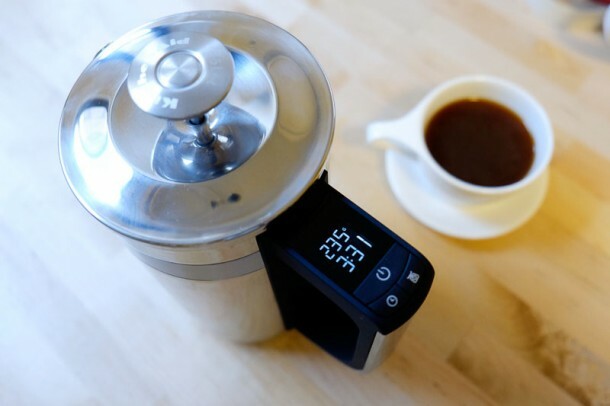 Granted, bona fide coffee geeks have already stuffed their kitchens with several generations of accoutrements promising to improve their performance, from temperature probes to bluetooth-enabled scales; for everyone else, the Precision Press provides an all-in-one solution that’s likely to be an appealing, straightforward way to gain access to more consistently good coffee. The Precision Press is well made, with little features you’d expect at this admittedly high price point ($149 MSRP, though it goes for less at some retailers). Design-wise, the chrome looks great, though it is a pain to keep perfectly shiny. I dig the blacked-out LCD with white illuminated numbers. Inside, the edges of the mesh filter are lined with a rubber gasket that promises to reduce unwanted fine particles sneaking into your cup – though it does take a bit of force to push the filter in as a result. I appreciate the focus on simplicity and functionality, but I would have liked the ability to set the timer to count down to an alarm (perhaps using a button to add time in 30 second increments). As currently designed, the timer only counts up after you start it. Presses have a reputation for being hard to clean, but the upside is that you have one less expense (paper filters) and one less item added to your waste stream. I found it painless to clean with the aid of a fine mesh sieve I had lying around (see above, swish some water in the press and pour out the used grounds, it’ll catch all but the finest particles), plus a long-handled bottle brush to scrub. You’ll want to disassemble the mesh filter after every couple brews to give it a deeper clean. One thing you will want to be careful of with this press is that the electric components are not fully waterproof. I didn’t run into any issues despite washing it pretty haphazardly, without minimizing splashes – but the instructions do warn against immersing it in water so I’d be cautious. I hadn’t used a French press in ages because all of my glass examples have broken over the years – something this sturdy KitchenAid press won’t do without some effort. I found my reunion with the press to be a nice change of pace from my usual fussy routine with an Aeropress or pour-over kettle. It won’t replace those brew methods for me, but it does provide a nice, stress-free alternative — as well as a totally different flavor profile. 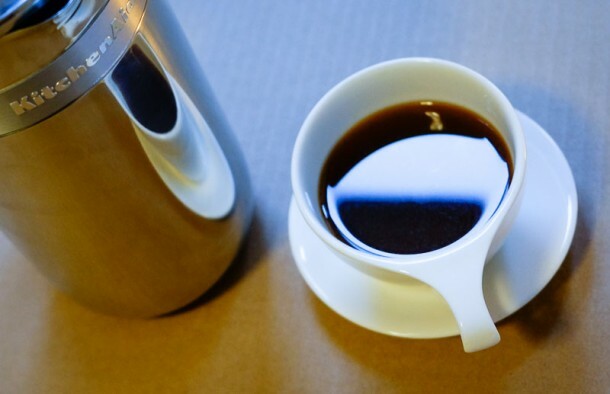 The basic premise of the French press is that you pour your coffee and hot water into the pot, wait a while, then press the filter down and pour the brewed coffee out. The mesh metal filter allows more soluble material to pass through into the cup than paper filtered methods do – accentuating the sweetness of a coffee and introducing a richer flavor profile, in my experience, though sacrificing some of the clarity and crispness you get with paper filters. Geekier readers will know this already and probably go so far as to choose their brew method based on what they want to highlight in their coffee. 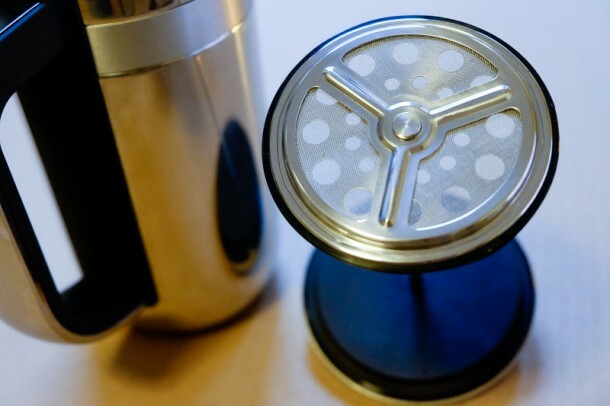 Regardless of your level of geekiness, you’re going to want to use a burr grinder to get the best results with a press like this. 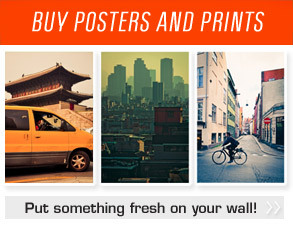 If you don’t own one already, spend your money there first. A cheap blade grinder will produce too many fine particles that slip right through the mesh filter, ending up as bitter sludge in your cup – not to mention unevenly extracting and wrecking your brew. Weigh out your coffee using a ratio of around 1 gram of coffee for every 14-16 grams of water (the KitchenAid Precision Press manual has a handy table with pretty good numbers to go by). 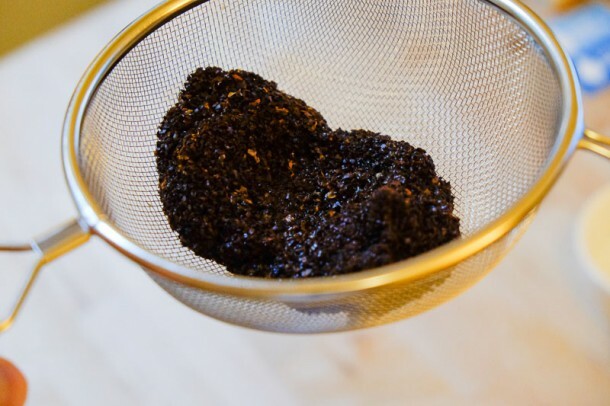 Grind your coffee using a very coarse setting – go coarser if you find the cup tasting unpleasantly bitter, and go finer if it’s tepid or too tea-like. If you have a tough time here, next time you buy beans at a reputable cafe ask them to grind some of your coffee for French press and keep it as a reference point. Briefly pre-heat the pot with some boiled water. Then mix your coffee and brew water (I aim for around 200-205F). Make sure the grounds are fully submerged – give a slight stir if needed after the crust has formed. Let it steep for a total of 6-8 minutes. (You can aim for shorter brew times, but a longer steep allows you to use a coarser grind and gives you a better final cup with less fines). Simple, right? 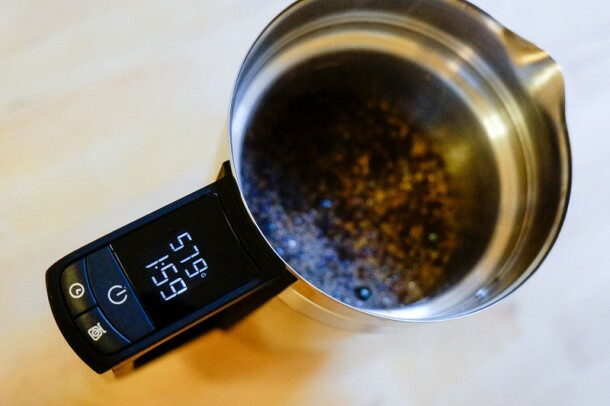 Adjust the grind or the steeping time up or down until you find the sweet spot. That’s where the built in scale and timer show their true value: you’ll know what worked or didn’t, and be able to repeatably get the flavor you want. 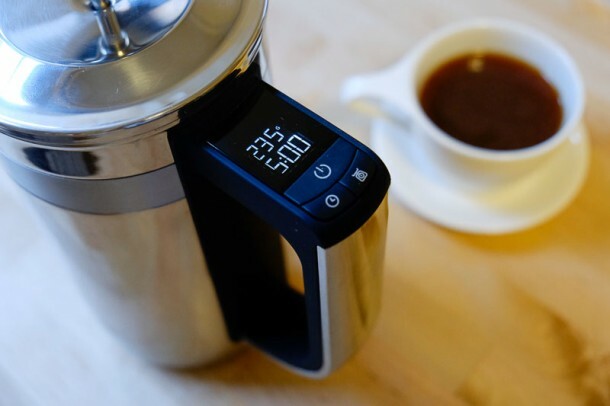 And that’s what makes this a compelling entry for folks who are interested in making better coffee without investing in a drawer full of gadgets or narrow-margin-for-error brew methods. You can follow developments with KitchenAid’s craft coffee products on Facebook, Twitter, Pinterest, and Instagram. Thanks for this review. 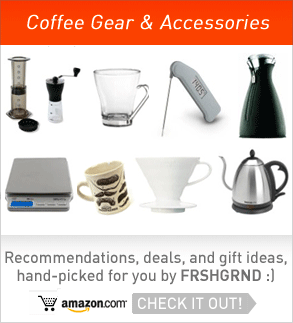 It is really nice and very informative about coffee gear. after read this post, I am knowing about new new information’s. Keep Posting.